Having a child, friend, or loved one with autism is challenging, but you should also be proud of how special they are. Spread autism awareness and show the pride you have in your loved one when you carry this puzzle piece pendant on your favorite key chain or wear it as a necklace. 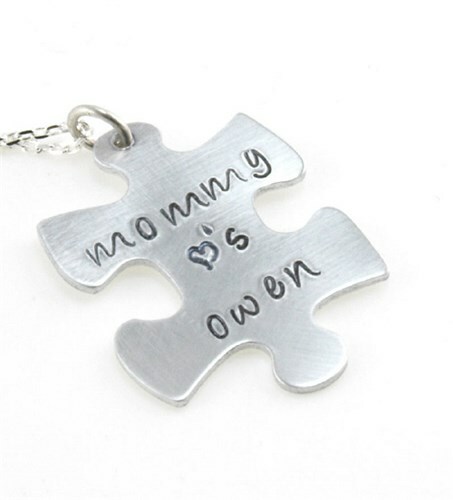 This 1.5” aluminum puzzle piece charm is hand stamped with any name or small phrase. It also includes your choice of a 18” silver plated necklace, heart key ring or a circle key ring. Free personalization is included. Today’s Price: $30.99 In Stock! Additional Info Our awareness jewelry will let you showcase the passion you have for the causes most important to you in a subtle and special way. This puzzle piece pendant will touch anyone who is passionate about autism awareness. Our Autism Awareness Ribbon Hand Stamped Necklace is another popular item.